But I have challenged myself, body and mind, to run this year’s Jerusalem half-marathon and March 25th I hope to achieve my goal with thousands of others. 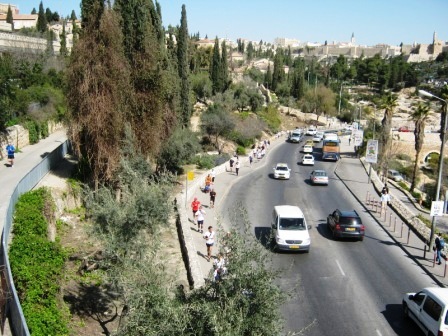 While I am super excited about the half, the real deal is the first full Jerusalem marathon taking place the same day. With over 10,000 people registered, it looks like this will be the country’s biggest marathon, so take that Tel Aviv (with your beautiful beaches, boardwalks and HaYakron!). In prepping for my half-marathon, I ran the first-ever Begin Race a few weeks ago. The run was free and I got a t-shirt, but those are the only nice things I can really say about it. There were a thousand people running three different tracks, 6k, 8k and 16k. We were funneled through Yamin Moshe’s narrow paths (the neighborhood adjacent to the Begin Center), where they were actually doing construction at the time of the race, forced through the city streets where they did not stop traffic or the light rail and best of all you had to run the same route four times. How boring, how dangerous and how about a little warning before the race itself? Not to mention we were with the baby stroller and there were steps in the race. 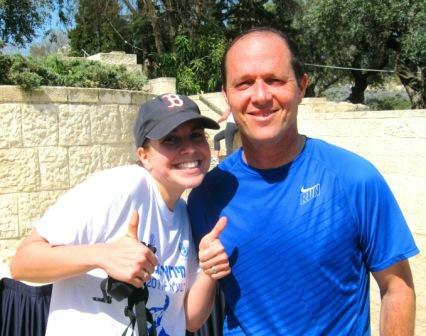 At the end of the race I saw Jerusalem Mayor Nir Barkat, who also plans to run the half-marathon (the full Marathon is his crazy initiative), and I told him my complaints. I’m sure he listened to me like he listens to all his citizens cries (please read that with sarcasm) and will make sure that the Marathon is not as disorganized, dangerous or just plain boring as that run. As I ran the race I made a list in my head of complaints that I will now share with you. In order to remember them I organized them alphabetically with the first letters. B: Bottles. Water bottles are dangerous to hand out to runners who want to take a swig of water and chuck the bottle. Needless to say, people were hit, water was wasted and there was a ton of litter on the streets. Stick with cups, yes it still makes a mess on the floor, but at least the water isn’t wasted and it doesn’t hurt when it hits your head. Oh, and runners be aware that people love to throw water on their body, which means if you are running behind you too will also be hit with a refreshing splash. H: Handicap accessibility, as in there wasn’t any. I did see a blind man running with his partner, and I also saw him run into a low level barrier. Besides steps, there were also holes in the street and uneven pavement. M: Medics. There were no medics or ambulances that I could see. I know the run is not a marathon but there should be some kind of medical emergency unit for the runners, and as far as I could see there wasn’t. S: Spit. This is just a warning to all that runners spit a lot and just like the water you may be hit. While spit doesn’t hurt as much as a water bottle, it is way grosser. T : Traffic. Like I said before, we ran on the sidewalks and in traffic since they didn’t close down streets. A free run indeed, but maybe next time charge us a little to close down the roads and everyone will be happier. T: Track. The routes were boring and not conducive to hundreds of people running three different tracks. There weren’t any clear signs to tell people where to go, and every now and then there was a volunteer who tried to direct you as you ran by. Good luck if you heard. OK so my first big race was a challenge more because of logistics and less about physical endurance, but I’m hoping that marathon day changes all that. I have trained for the past two months and run all over this holy, no scratch that, hilly city and I can’t wait to join thousands of runners from all over the world who will share this exciting experience with me. See you on the other side of the finish line! Got a tip for running the streets of Jerusalem? Share them here! "Running in Jerusalem or How to Make Buns of Steel!" 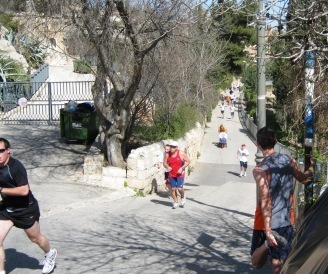 was written March 17th, 2011	by thebigfelafel, and filed under Good Causes, Jerusalem Scene, Wisdom Gained and tagged fitness, half-marathon, health, Israel, jerusalem, Jerusalem marathon, marathon, Posts by Molly, race, running.